Must have foods for Healthy Eyes : Vitamin A, Proteins, Vitamin c, B Complex Foods. • Topping the list of necessary nutrients is Vitamin A. A sure way of getting an adequate supply of this vitamin is by consuming enough fruits and vegetables containing beta-carotene, which gets converted into ‘retinal’, a form of vitamin A. A combination of retinal and a protein called ‘opsin’ produces ‘rhodopsin’, a major pigment in the retina of the eye that contributes to good vision. Vitamin A is also a strong antioxidant and does away with the by-products of oxygen that damage the eye. • To help vitamin A in its functions and also to keep the eye muscles working at their best, we need a good amount of proteins. • Though vision is created when light enters our eyes, this same light produces some chemicals that could damage the eye. What protects our eyes from such damage is Vitamin C.
• Inclusion of the B-Complex range of vitamins in our diet will ensure that the eyes function in a healthy manner. B-complex vitamins also keep the skin around the eyes smooth and supple, so that there are no give-away signs of ageing, like crows feet. • Vitamin E allows the eyes to focus more readily and with less effort. It helps form new blood vessels and cuts down the risk of suffering from eye disorders. • Among the minerals, Iron plays an important role in the circulation of blood to the eye tissues. A lack of iron will cause tiredness and lethargy, which readily shows in the eyes and will take away that youthful look. • Zinc protects the eyes from infections. 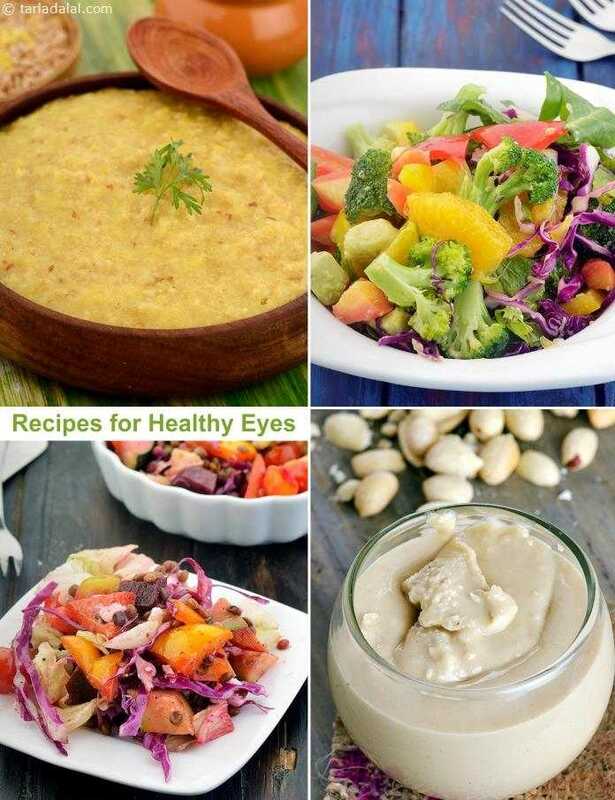 • Selenium, an antioxidant, prevents the eye tissues from getting damaged. That’s surely a lot of nutrients that our eyes need! Well, they are, after all, our windows to the world, so nothing is too much for keeping them lively, bright and healthy. Of course, you don’t have to worry about where you will get all these nutrients if you just follow these simple, easy-to-cook recipes.